More and more often we ask ourselves if technology truly taking over, most people agree with such statement. It is still hard to answer it is good or bad, despite lots of articles were created. Here are several points why technology is too closely related to our lives, which can be useful for writing an argumentative essay. Today people prefer using machinery work instead of manual one. It, of course, has several pluses, as manufacturing of different goods becomes much easier, their price is lower and quality is pretty good. Today factories can provide a big amount of products with no shortage as it was decades ago. Moreover, producing is cleaner and safer, there are less traumas at the facilities and human`s factor is almost canceled. However, lots of people lost their work because of these machines. We can say that every single thing we use in our lives is made thanks to technology. These are devices modern person cannot live without. It is funny and sad at the same time while you see two friends chatting with each other when sitting nearby. We use out phones to photo every moment in our lives and then put it in social networks. As a result one doesn`t have any sweet memories while living in fabled world. Sure, mobile gadgets have many benefits, as you don`t have to cross the whole country in order to speak to your friends and relatives, in addition parents can be always assured that their kids are safe. 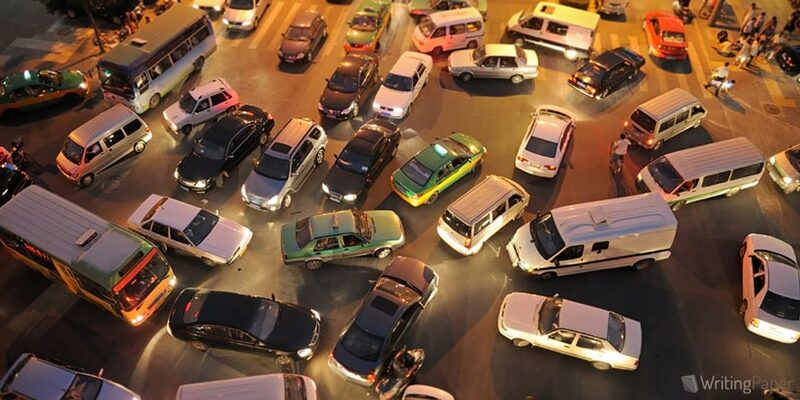 Look at the typical megalopolis, thousands of cars are standing in a traffic jam. Tones of traffic fumes are polluted the atmosphere, making people`s lives shorter and full of illness. Auto is not a luxury thing anymore; it becomes a necessity. Moreover, one uses a car if he or she only needs to walk plenty meters to the nearest shop. Consequently, people become more and more lazy nowadays. Modern kids are not interesting in football playing with their fellows anymore. Moreover, there are free in using computer and various gadgets. Children spend their time playing video games and sometimes it becomes an addiction. Of course, it is not the worst idea for relaxing but If it`s too much physical and mental health suffers. Today people waste thousands of dollars in order to buy the latest devices with actually unnecessary functions. Advertisements play a role here. People are hunting for the new versions of smartphones, stand in kilometer long ques in front of stores and take credits to purchase it. The profit of gadget producers is one of the most significant arguments which confirm that technology took over our lives. All in all, it is just a part of a big amount of examples how technology takes over human`s lives. You can find even more, just look around and think how many gadgets you use every day. What picture you usually see in cafes, parks and other public places? Of course, everyone is busy with their smartphones or laptops. However, it is unfair to claim that technologies bring only bad things in one`s life. It undoubtedly has lots of advantages, which make mankind`s existence more effortless and favorable.